Can house prices teach us anything about schools? House prices are higher near good schools, yelled the headlines. Research from Bank of Scotland suggested average property prices have reached £277,134 near what were described as "Scotland's top 20 state secondary schools". Other stories from other financial bodies have painted a similar picture. From a purely financial point of view, these stories are perfectly fair - property prices are higher in the catchment areas of many schools which have relatively good exam results. But do these stories say anything about the quality of the education on offer, or whether parents are actively choosing to move to an area simply because of a school's reputation? In Scotland, it is still the norm for children to attend the secondary school covering the catchment area in which they live. Parents can make a placing request to send their child to another school instead, but there is no guarantee this will be granted. The family address is the only means by which a parent can be sure of which school their child can attend. The most important question is over what constitutes a "good" school, far less what might be described as a "top" school. 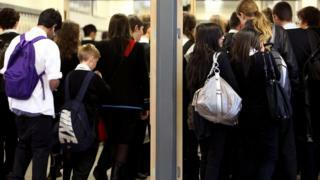 In Scotland, there are no official "league tables" of school performance based on exam results. Exam results in isolation are not used by the Scottish government, councils or inspectors to judge a school's performance. It is widely accepted within Scottish education that there is a broad co-relation between the number of students getting the best grades in Highers or Advanced Highers and an area's affluence. In isolation, exam results say little or nothing about the quality of the teaching. Indeed, the schools on the list quoted by the bank are all within broadly prosperous areas where house prices were already relatively high. Sometimes, they could be said to be in the most desirable parts of urban Scotland. A greater proportion of the children at schools with prosperous catchment areas may come from stable backgrounds, while fewer face the challenges of poverty and disadvantage. Parents who are themselves highly educated may be in a better position to personally help their children with their schoolwork. More may be in a better position to pay for additional private tuition if their child is falling behind or finding a subject difficult. All this can be reflected in the raw exam results data. Co-relating a school's exam results with the demographics of the catchment area may be more telling, though. For instance, even a school where a relatively high proportion of students get top grades may actually be coasting compared to another school with a similar catchment area. Similarly, some schools in less affluent - or even disadvantaged - areas may have made huge strides forward or be punching well above their weight. Education Scotland has data on its website which, many within Scottish education argue, can help parents judge their child's school's performance more objectively. The way this data is presented makes it hard to reach simple judgements about whether a school in, say, Castlemilk is better than one in Giffnock - but it might help them decide whether their school is doing as well as it could be. So are parents actually paying a premium to guarantee their child a place at a school which simply appeals to them? There was a row a few years ago when changes were made to the catchment area of St Ninian's High in Giffnock. Some parents who had moved to the area in the belief their child would automatically be able to attend the school expressed concern. Similarly, there are examples of estate agents highlighting the school that children would be entitled to attend when they are marketing a property. More broadly though, it's hard to say whether parents are moving to a place simply because of a school's reputation - or because the area as a whole seems like a pleasant place to live and bring up children. Undoubtedly some parents who expect their child to get good exam results and a university place may feel happier sending their child to a school where, it would appear, a greater proportion of youngsters come from families with similar aspirations. But to simply conflate exam results in isolation with "a top school" drives many within Scottish education to despair. Parents can get information on a school from the Parentzone website.